Penbox: Faber Castell Pens including the Ambition, Emotion, Ondoro and Loom. People are fascinated by all that reflects their desire for something special: unusual design, intelligent solutions and outstanding function. The Faber Castell Design ranges that include the Ambition, E-Motion, Ondoro and Loom pens and accessories aim to please these desires. 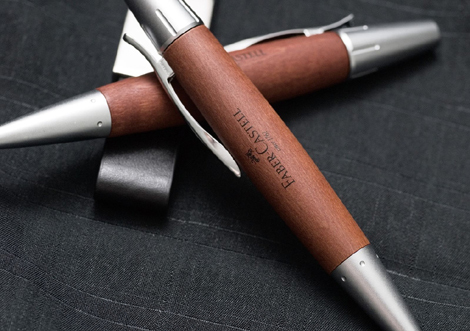 Faber Castell Design writing instruments and accessories take new and unmistakable paths in matters of design, materials, and colours. In many ways they also show the roots of writing - the Faber Castell history goes back to the year 1761. They have been responsible for many decisive developments, and in that respect, nothing has changed to this day. All metal, resin and wooden finishes. Please telephone or email for pricing and availability.